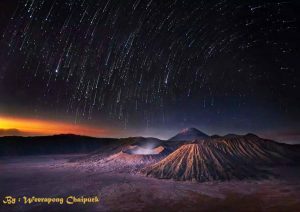 Mount Bromo Milky Way Photography tour 2 days has been popular travel package for Photograph in Java Island, Indonesia. Almost every season most famous photographers enjoy Mount Bromo Milky Way Photography at midnight only to wait for Galaxy appearance from the highest peak. There are several summits on the highest Peak to enjoy the Stargazing at Pananjakan Peak , It consists of Mentigen Hill, Kingkong Hill, and Seruni Point (the second viewpoint). The most visited place to for Milky Way is from Pananjakan peak with altitude 2,770 meters high, The Pananjakan peak known as the highest and only possible reached by The private Jeep from Hotel near Bromo mountain. Pananjakan Peak not only good place for Stargazing trip but also good for the Sunrise, Sunset. This peak, better for Camping tour package to see Mount Bromo Milky Way from the campsite. most photographers choose the Panajakan Peak to enjoy Mount Bromo tour by camping. If you are the first time enjoy Mount Bromo Milky Way tour 2 days, You must start from Surabaya Airport or Malang in the morning and flight departure in the afternoon using public transportation. Also possible through Our travel agency, You only inform Us planning time, visitor amount and the travel package duration, Then Our partner will arrange special itinerary for Mt Bromo Milky Way Photography package relaxedly until You are really satisfied. Our driver will pick you up at your arrival by private AC (air-conditioned) van, then take you to your hotel in Cemoro Lawang for 3,5 hours driving. After you get your hotel, stay relaxedly while enjoying the circumstance like Sunset from Mentigen Hill. Finish enjoy your Photograph, continue to enjoy the Sunrise at 05.20 AM, massive Sea of Sand, Mt Widodaren and Mt Batok. From Pananjakan Peak, You will also able see Semeru volcano summit (the highest volcano in Java Island). If You are interested to try Semeru volcano hiking, You can choose on May – November. Continue to the Crater by stop at Sea of Sand (parking lot) then take soft trekking to the crater for 30 minutes or you can take the horse transportation for 15 minutes. Finish your photograph from the highest peak, sunrise photography and all the views, return to your hotel to have breakfast, relax and check out from your hotel to come back to Surabaya, Hotel, Malang and Banyuwangi or Yogyakarta. Get your location, finish Mount Bromo tour 2 days 1 night for Milky Way Photography. If you think that Mount Bromo tour package for Milky Way has the most important value, You can choose the Mount Bromo Milky Way time on April – September. If You choose on other months, You can take the calendar date between 01st – 15th and between 27th – 30th in each months. Before You choose the Milky Way tour at Mt Bromo, You can bring a jacket, gloves, hat, long pants, and personal medicine because of the temperature on the high peak around 03 – 06 degree centigrade. Dont forget to bring complete photography tools to support your photography perfectly.